Just because day 8 was our travel day home/to New York didn't mean we weren't going to make the most of the time we had left! 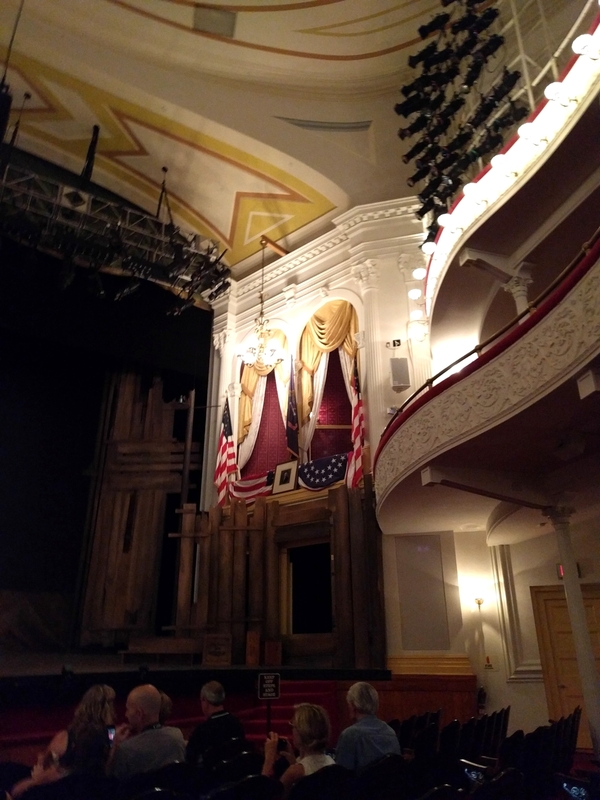 We left the house early that morning to go tour Ford's Theatre, where Abraham Lincoln was assassinated. We got there just a few minutes too late for the 9:00 tour, so we got tickets for the 10:00, then went to Paul for breakfast, our favorite chain we had eaten at in Paris. When we went back to the theatre, the first thirty minutes were spent in the museum portion. Like I said on day six, we were pretty tired of museums at this point, so we looked around, but Brandon and I watched every video we could until it was time to go into the theatre for the guided portion. The guided portion was basically just a run through of everything that had happened that day leading up to the assassination, and the events after. We didn't get to actually tour the theatre, but everything we needed to see could be seen from where we were sitting. Like all the other places we had been that week, it was neat to just be sitting in a place so important to history. We still had a little time left after the theatre before we had to head to the airport, so we went back to the Smithsonian Museum of American History to see one exhibit that we had missed. Luckily for us, it wasn't as busy then as it had been on the Fourth, and there was no line for what we wanted to see. What we had missed was the coolest, and probably most important exhibit there. It was the actual flag that inspired Francis Scott Key to write The Star Spangled Banner. The flag itself was huge, but I couldn't believe that the flag from 1814 was right there in front of my eyes! I'm so glad we went back to see it, because it definitely is in my top five favorite things from the DC portion of our trip, and it was the perfect way to round off our week there. Even though we were flying to New York and everyone else was flying back to Utah, our flight left from the same airport around the same time, so we all headed there together and had some lunch before going our separate ways. We had just enough time after the family took off to grab some treats for the flight, and I am so glad we did because, surprise surprise, our flight didn't take off on time. There was weather in New York, so we sat on the tarmac for an hour after we were supposed to have taken off! So we ate our snacks, watched the two episodes of New Girl we had downloaded, and tried to enjoy the fact that, even though we were stuck on an airplane, at least we weren't walking around in the heat and humidity. Finally we got to New York, took the subway to our hotel, and then tried to decide if we were hungry enough to go searching for food. It was only 8:30, but we both were still full from lunch/treats and decided that our fatigue outweighed our hunger. So we turned out the lights and were both asleep by ten!